My daughter wanted to be an angry bird. 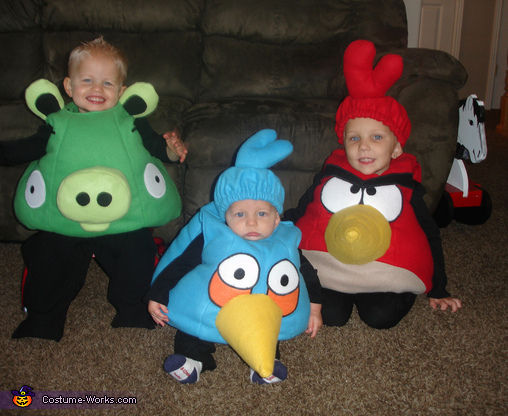 So I set out to make the ultimate angry bird family costumes. I used a pumpkin pattern to create the body of the costumes and then I made up the faces to look like the different characters. The bodies themselves are made out of fleece and the inside is stuffed with fiber filling. The faces are made out of felt and ironed on then sewed on. I just made up my own faces since there is no pattern. It cost about $30-40 dollars per costume, but it was well worth it! wow they are so cute!!! where will I be able to get a pattern?? Good Afternoon. I was wondering if the red angry bird costume was available to purchase? Hi! Do you make/sell these costumes? I would be very interested! We are looking for a hatchling costume for my one year old....do you sell them or know where they do??? Sooo cute!